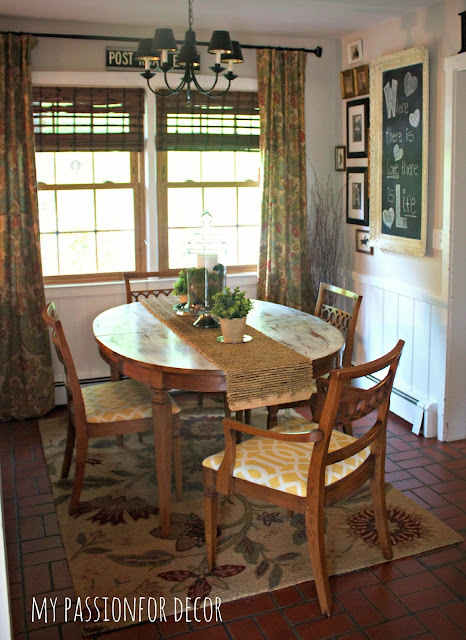 The Ever Changing Eat-In Kitchen And A Big Announcement! My taste in home decor is always changing and evolving, which means my house is a revolving door of things going in and going out. What works for me today might not be what I want or like a month from now. My style ranges from mid-century modern to vintage industrial with a bit of shabby chic thrown in. I'm allover the map....I love it all! One of the many benefits of redoing furniture and shopping vintage is that I'm always finding new and different pieces. My Husband really does call our house a revolving door of furniture and decor because it seems we're always moving something in or out. For some people this might drive them crazy, but thankfully I have a very understanding husband! I've been this way since I was a child. I was always moving things around in my room and trying to change things up to match my style, my mood or just to pass the time. Some things never change! Since we've lived in this house we've had three different sets of kitchen tables and chairs. Some have worked well for us and some not so much. Hunter didn't like the chairs we had at one point and complained how uncomfortable they were (not that he ever wants to sit when it's time to eat anyway!). The Hubby didn't like two of the tables because one was too big and one was to small. No one was happy with the kitchen table and chair situation, including me. One day while perusing Facebook I saw a listing for a dining room table and chairs. I didn't jump on them right away because I already had way too many projects waiting for me. However, a week later the ad was still up so I showed the hubby and he liked them! They had great lines and the six chairs were unique, plus it had two leaves which meant it was versatile. When it came time for figuring out how to get everything to my house the woman I bought them from was incredibly helpful. I paid her a bit extra and she borrowed a truck from a friend and delivered them to our house. It couldn't have been any easier! I didn't take a before picture of the table and chairs, but it's OK because I didn't do a lot to them. Hunter was in the hospital when they were delivered and everything was a blur. This house is dark and difficult to take pictures in. For this reason, I usually take pictures outside in front of the tree. Since I was in a hurry to get this project done (I was tired of listening to the complaints!) 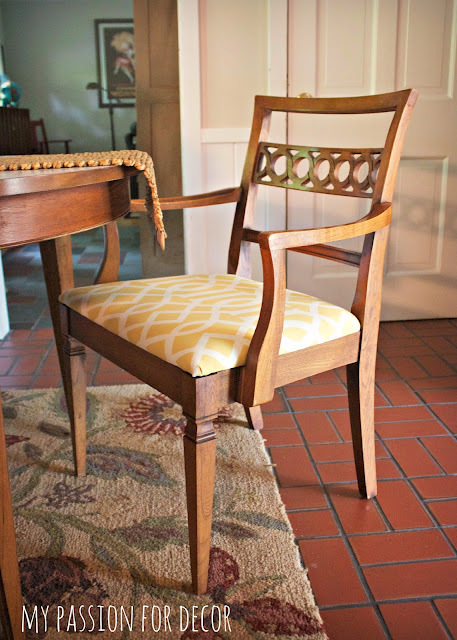 I painted and reupholstered the chairs inside since there wasn't too much work to do. That meant I had to take inside pictures...UGH! Here is the table in it's new home. 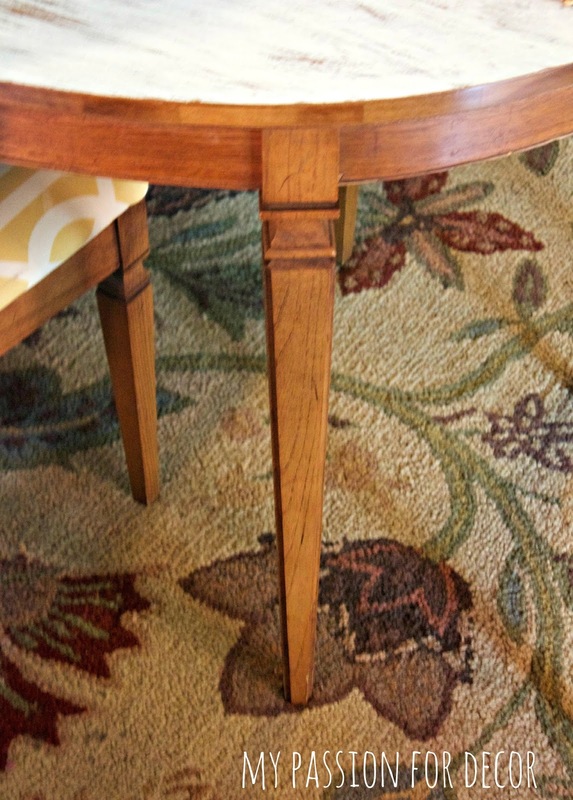 The table and chairs I believe are walnut. The chairs are comfortable to sit in and sturdy. There are six chairs and obviously we're only using four. The Hubby made me promise I wasn't going to cram them all in the space. Two of the chairs are being stored in the basement, but I did reupholster all of them at the same time. This is what I fell in love with when I first laid eyes on this set....the chairs.....they make me so happy! The circles at the back make me swoon! They're unique and have a timeless mid-century modern kind of feel that I love right now. 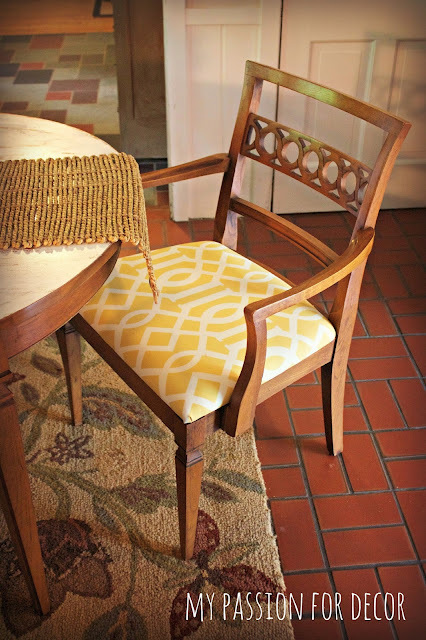 The chairs had been reupholstered a couple of times before so I removed the two layers of fabric. The fabric was a floral/berry fabric that didn't work for me. I went with my favorite outdoor fabric. You might recognize the fabric from another post I wrote about my Turquoise and Yellow Cane Back Chair. I'm a sucker for graphic prints. I want this print in a wallpaper for behind my bed! The fabric was a risky choice due to the light color and the fact I have a messy almost 8 year old boy. After I finished attaching the fabric I sprayed two coats of scotch guard on each seat. So far, it's working great. Yesterday, Hunter spilled red water all over the chair and it didn't soak in and came right off! I had changed the rug in the fall because I didn't like how the other one went with my Pottery Barn curtains, but since the floor is so dark (not to mention ugly) I wanted to lighten things up a bit. 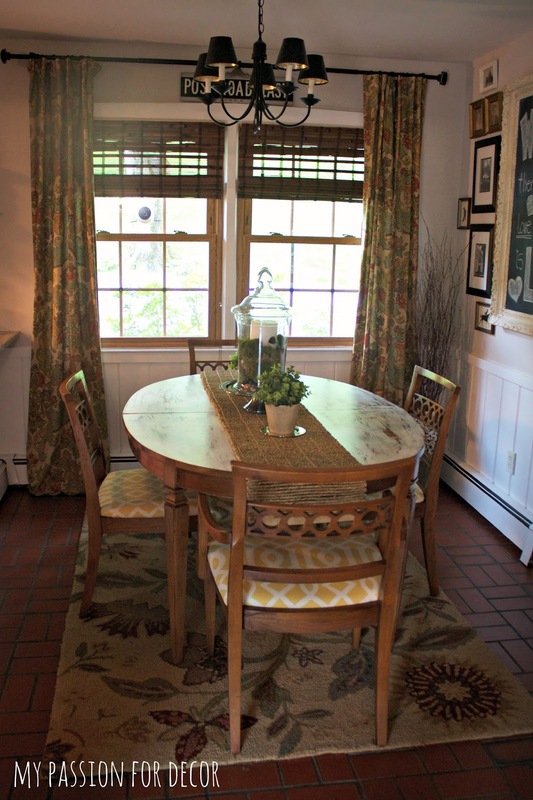 This is another reason I went with the bright, cheery yellow and white fabric on the chairs. To brighten things up a bit more I used Chalk Paint® by Annie Sloan in Pure White on the top of the table. I thought about painting the whole table, but I liked the idea of keeping the wood. I painted one coat of Chalk Paint® on top, then once it was dry I took a wet cloth and wiped off some of the paint. 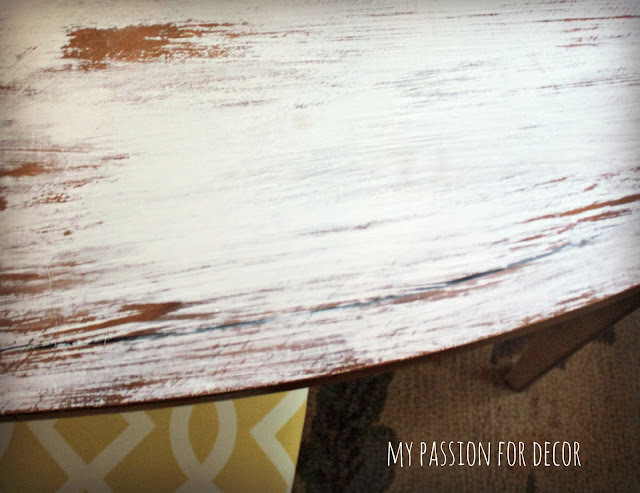 I wanted the table to look like the paint had worn off over time. The wet cloth worked perfectly. Not to mention it's a lot less messy than sanding. No dust!! 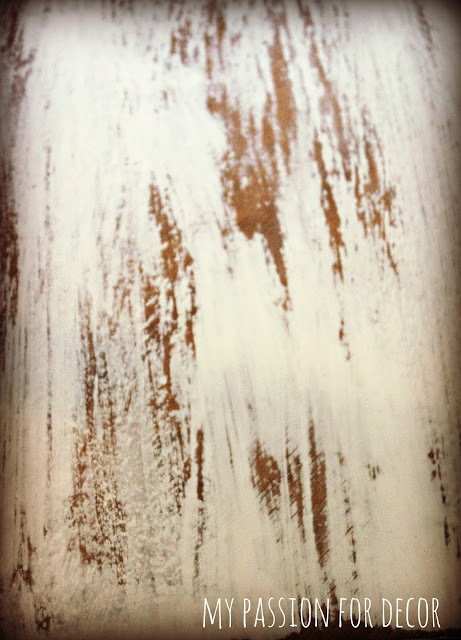 The wipe-off method gives a different look than sanding. It looks more worn and natural in my opinion. After the paint dried again, I dry brushed a bit more paint on top then wiped again. I repeated this process one more time before I had the look I was happy with. 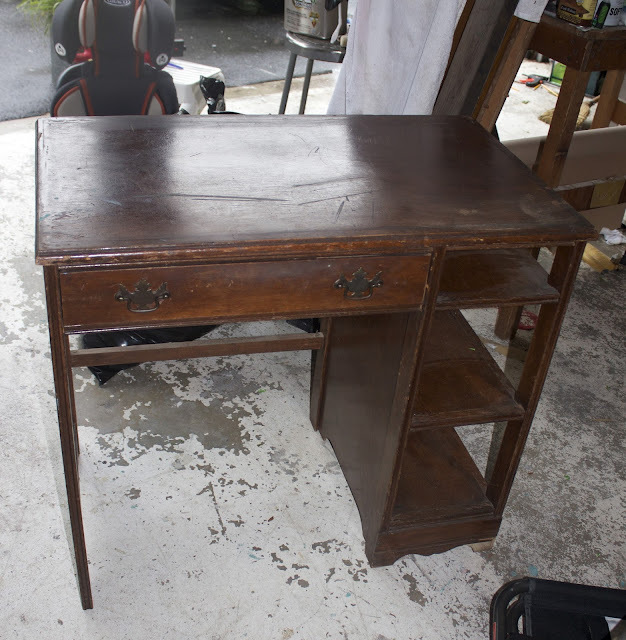 To protect and finish the top I coated it in two coats of Annie Sloan soft clear wax. For now this room is working well for us. I don't love the chandelier, the height or the placement but since it's not mine I have to live with it. I did add new shades I found at an estate sale and they help a bit. The way I painted the table helps hide any imperfections. Hunter was doing his homework on the table last week and I gasped when I realized he was writing directly on the table. Second graders push so hard when they write! There were little numbers imprinted in the table! This had happened a few times before on our coffee table, so I didn't freak out. I added another coat of wax and the numbers were gone. I like how the dark line around the outside of the table top shows through in some spots. The table was in pretty good shape, but the top had a spot where someone had put something really hot down and it left a mark. It needed something done to hide it. The new table and chairs are working well for our family. It only took three tables and three sets of chairs to find the perfect fit. So far Hunter and the hubby give it two-thumbs up. I've mentioned before that our living situation is temporary. We've been living in our current town since the hubby was transferred with his job from Canada to NY. We've been here almost three years knowing we would buy a house when we moved back to Canada. It's been a difficult few months around here, but this week we got some amazing news!! The hubby has done such an amazing job and worked so hard that he was presented with an wonderful opportunity....to stay here in the US! We never really thought this would be an option. When he signed on for this job transfer he was told it was a three year work visa and at the end of the time we would go back to Canada. I'm so proud of him and thrilled beyond words for him and for our family! We don't have to uproot our family yet again and we can finally buy another house. No more starting over with friends, finding a new doctor, vet or grocery store. We're home!!! We're now in the process of finding a house and trying to move before the school year starts again. Wish us luck!!! Thank you for taking time out of your day to read this. I love when I hear from you! 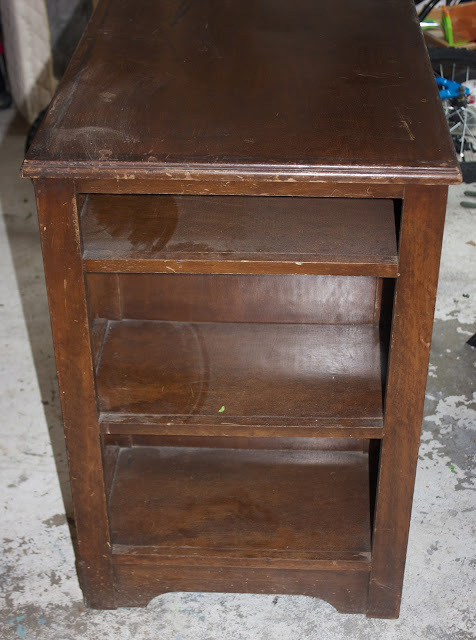 One of the many benefits giving old furniture new life, is my friends and readers are always on the lookout for great deals for me. A lot of times when people have furniture they no longer have a use for they will ask me if I am interested in taking them. This almost always ends up with me taking the furniture off their hands. This happened again a few weeks ago when my sweet friend, Charlene, sent me a picture of a cute little desk she was no longer using. She offered it to me for free and I jumped at the chance! How could I possibly say no?! 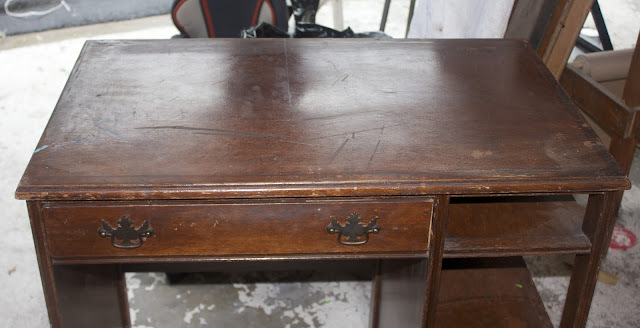 Here's the the desk before. I instantly fell in love with this desk. I thought it was a genius idea to have shelves on the side and only one drawer. I'm the kind of person who likes to see that I have because if I don't see it....it doesn't exist! Whoever designed this desk must have the same challenge! 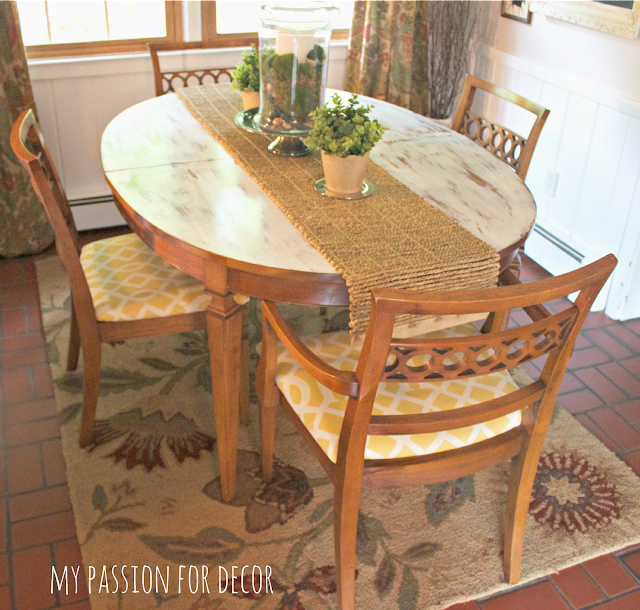 I had recently sold a lot of my refinished furniture pieces, some of which were in our home. 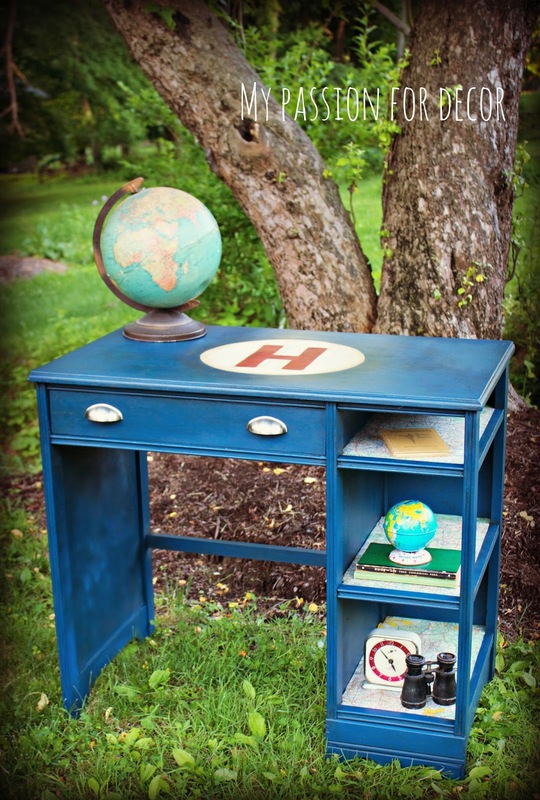 One piece I sold was a desk I had painted last summer for my Son, Hunter (Hunter's Desk). 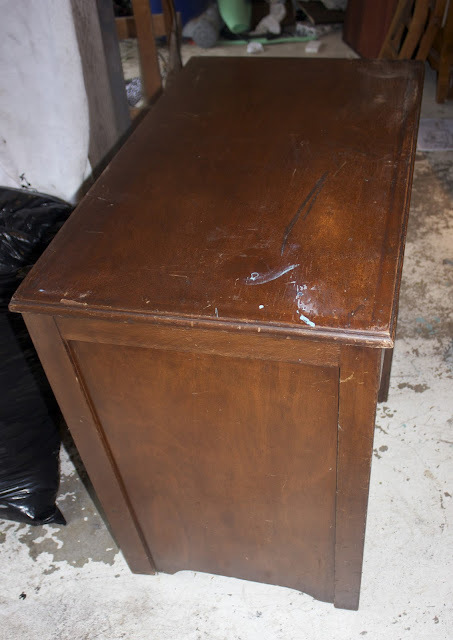 I loved this desk, but I found he never used it. Instead of using the desk for working or playing on he would put the toys I asked him to put away on top of the desk. This wasn't working for me or for him so I decided it was time to part with the map desk. 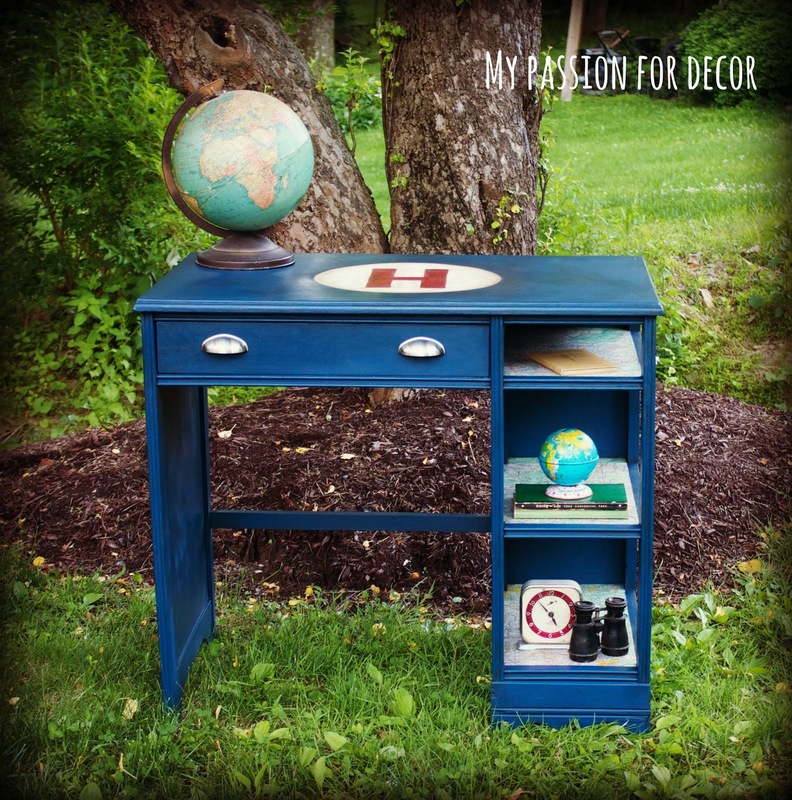 The new-to-me desk was just sitting in the garage waiting for a new home and that home was soon to be in Hunter's play room. 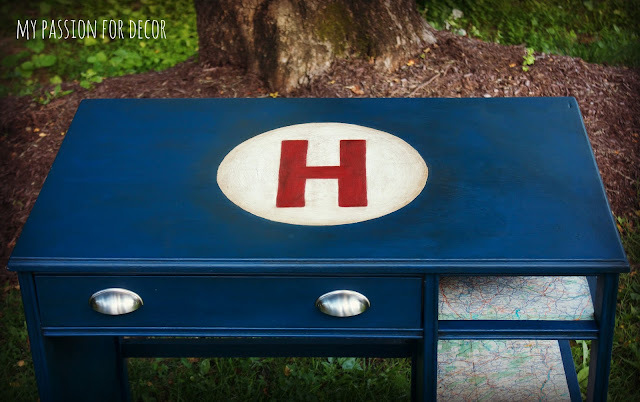 When Hunter and I started talking about the desk project and what he envisioned it looking like, he said he wanted a Union Jack painted on top. However, I had painted an old school desk for him last year with a union jack on the desk top (Union Jack Desk). 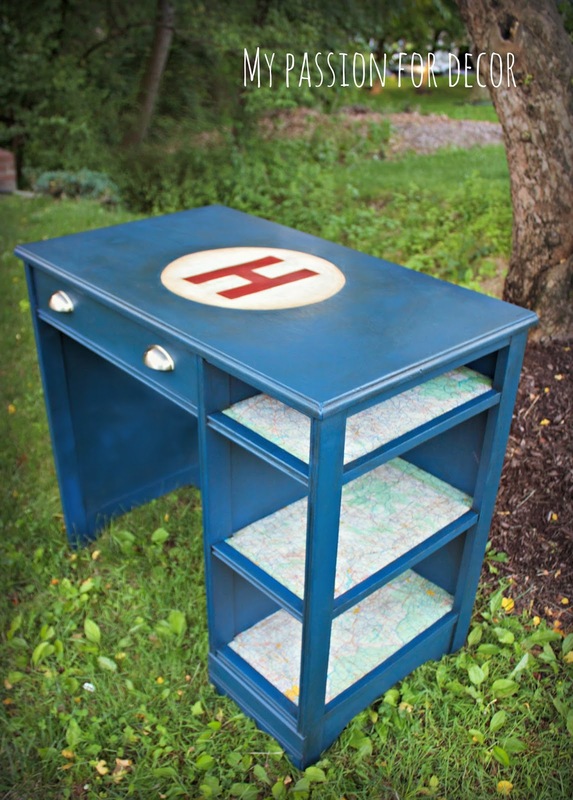 The Union Jack desk is in his bedroom and really he doesn't use that one either (hmmm this seems to be a theme here!) I don't like to do the same thing over and over so I figured it was time to try something new instead of another Union Jack. I asked Hunter what his second choice was be and he said "A 13 star US flag, you know like Betsy Ross made." OK I won't lie, I knew the flag, but had to look it up on the net to refresh my memory. After which, I agreed that it was a great idea....that was until I started trying to plan out the stripes and stars on the desk top. I worked for about an hour trying to figure out the math, then asked him for his third choice. ( I'm creative AND naturally blond....math has never been my strong suit! ) Between the two of us we came up with a new plan and I got started painting. 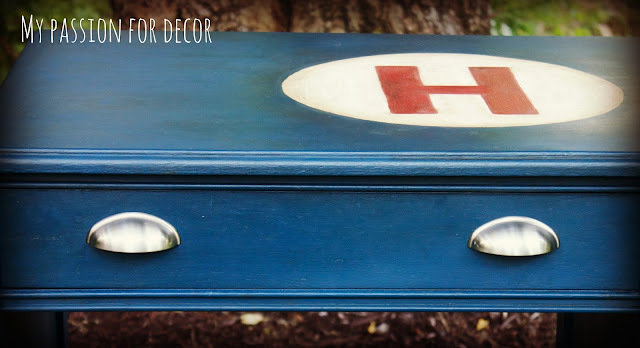 I used Chalk Paint® by Annie Sloan in Napoleonic Blue, Old White and Emperor's Silk. I have to point out something here....Napoleonic Blue is one of the most amazing colors. 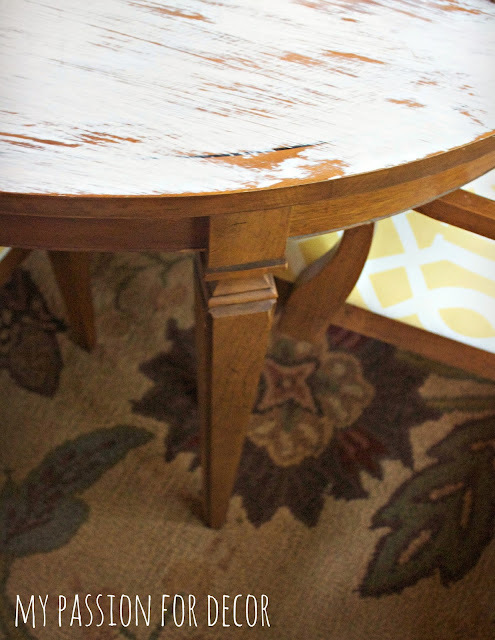 With Annie Sloan soft dark wax, the color is so deep and varied. 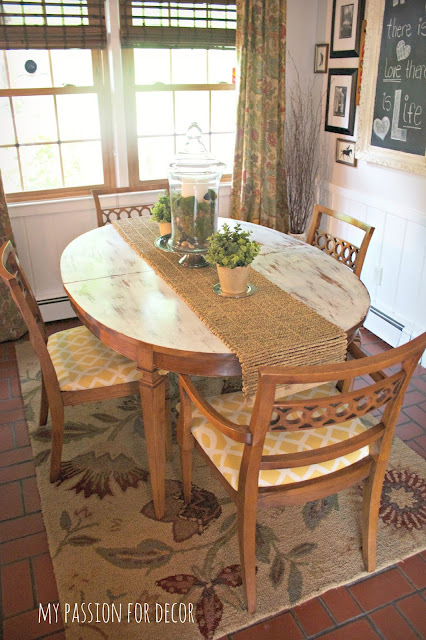 It has and always will be, one of my favorite Annie Sloan colors. 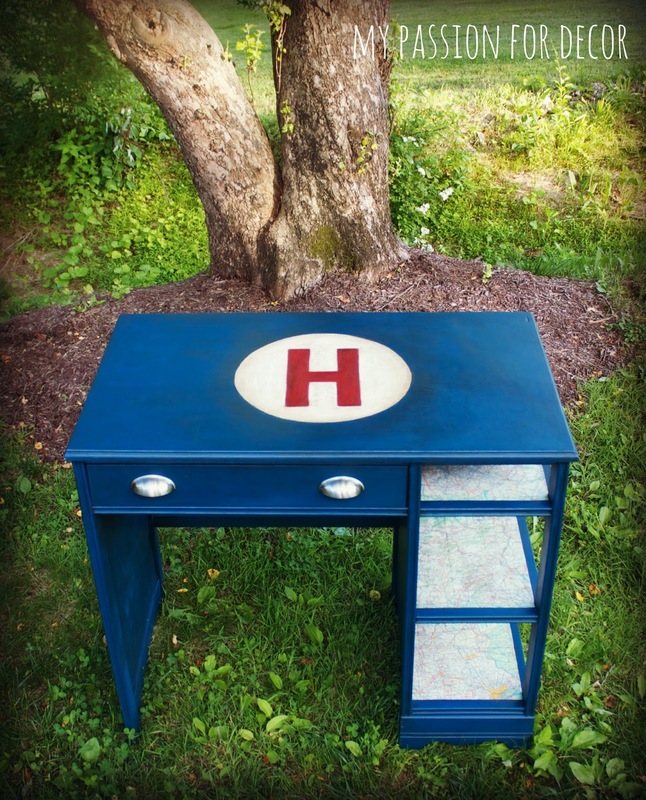 I painted the whole desk in two coats of Napoleonic Blue. After I was done I stepped back and had a look. The desk looked a lot better, but I wanted the shelves to stand out a bit more. 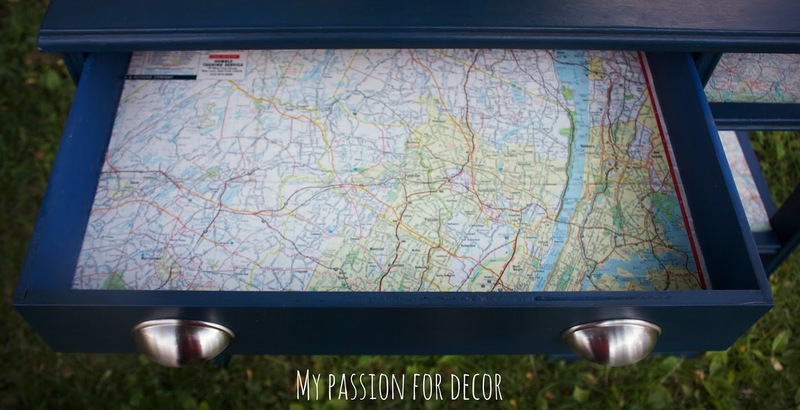 Hunter loves anything to do with cars, but he also shares my love for maps and globes. I had purchased some vintage gas station maps from an estate sale last year and thought this might be a perfect chance to use them. 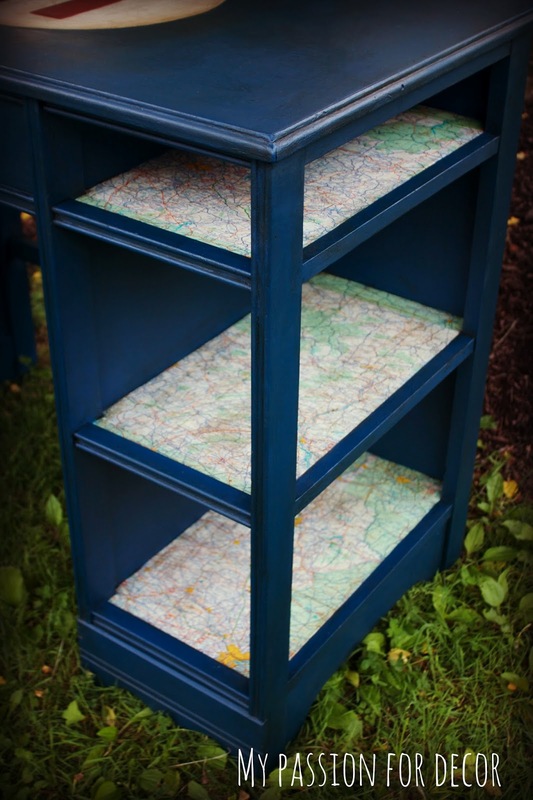 I decoupaged the maps onto the shelves and inside the drawer with Mod Podge. I thought it was going to be a lot harder than it actually was. They went on and stayed put without bubbling! 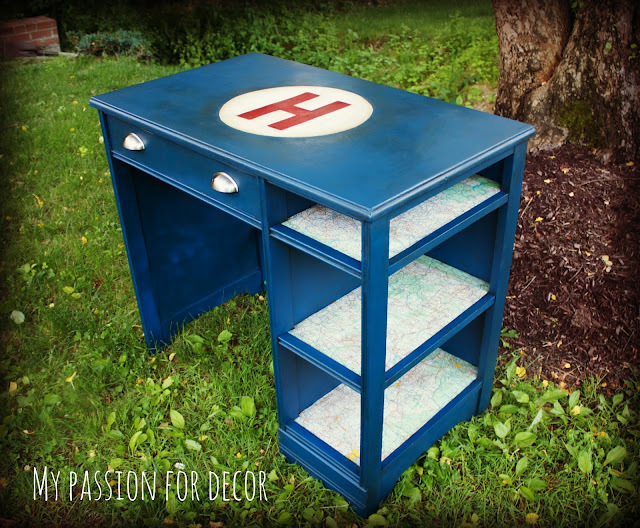 I topped each decoupaged shelf with two coats of Mod Podge for protection. 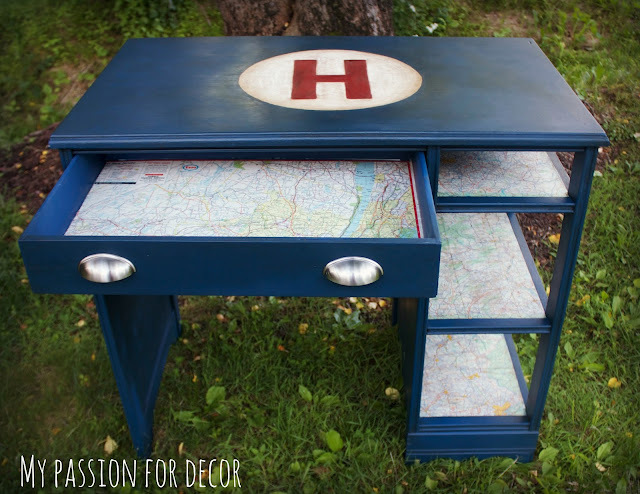 After the maps were on, I waxed the entire desk, including the map covered shelves, in a mixture of Annie Sloan soft wax in clear and dark. Next came the tricky part! 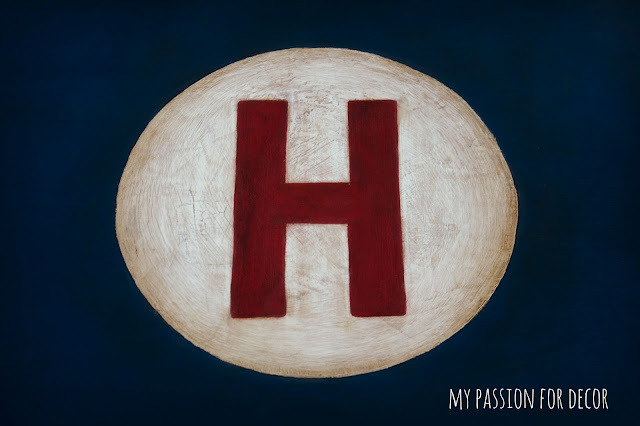 Hunter and I had decided to paint a red H in the center of an off white circle in the middle of the desk top. The idea was inspired by the vintage map I used on the shelves, a Gulf gas station map. The logo for Gulf on the old map is an orange, and white circle with Gulf written in blue. To get this all done without it looking like a 2 year old painted it, I took a large circular platter I had in the kitchen and traced around it in pencil. Then I used the Old White paint and a small artist's brush to paint the outline of the circle. For the inside of the circle I used a small paint brush and 3 coats of paint. It wasn't hard, but it did take some time and some patience. To speed up the process I used a heat gun to dry the paint and to give it a bit of a cracked and aged finish. It worked great! For the H I used a craft store letter I had lying around and traced the shape in the middle of the circle. This time I used Emperor's Silk paint and an artists brush to fill in the letter. Again this wasn't difficult, but did require some patience and a steady hand. I painted 3 coats and in-between each coat I again used the heat gun to dry the paint and give it some character. Once all the paint was dry I finished it off with a bit 500 grit sand paper to even the finish out. Then applied the same mixture of clear and dark waxes. Changing the drawer hardware was the last step. I replaced the old hardware with some library drawer pulls I had purchased at Target on clearance. The nickel library pulls were the perfect finishing touch. Here's the finished desk all dressed up for some pictures out by the tree. I'm really happy with how it turned out. It's just right for an almost 8 year old boy. I think it's something that will grow with him over the years. I like how the desk only has one drawer. I know Hunter, and when he's in a hurry to clean up he will shove anything he can into a drawer. Hmmmm....wonder where he learned that?! The colors in the vintage gas station maps work perfectly with the paint colors. 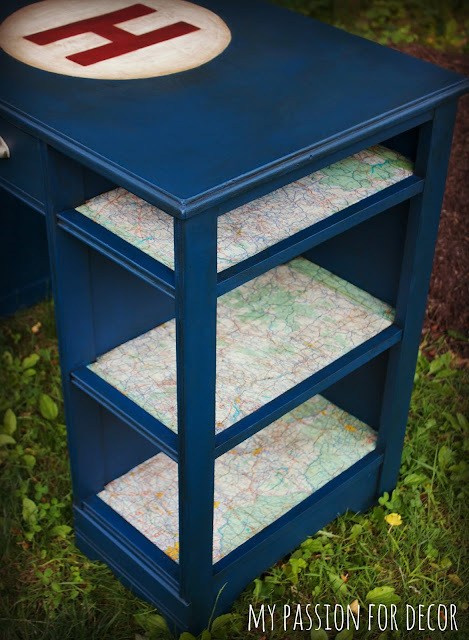 In case you were wondering, the map in the drawer is an old Esso Map of New Jersey. The map on the shelves is a Gulf gas station map of Pennsylvania. I think it's funny how large and cumbersome maps used to be! I can still remember my parents on our cross country trip from LA to NY trying to navigate our VW Beetle with two kids....all while trying to find their way using a map very similar to these. The drawer hardware definitely pulls it all together. It goes great with the vintage gas station look I wanted. A lot of the depth in the color and texture of the paint gets lost in pictures. This picture gives you an idea of the crackling and depth of the paint once the wax is added on top. It has the look of old cracked and aged porcelain like vintage gas station signs. One day soon I hope to take some updated pictures of Hunter's play room. I've made a lot of changes in that room since. 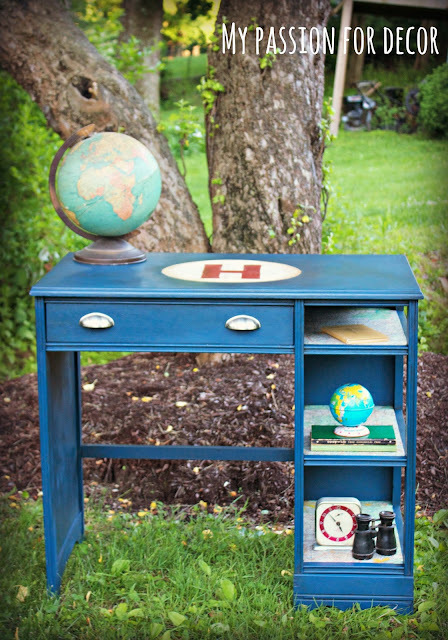 The desk looks great in the play room with the vintage license plates and stop sign I've added since last year. This weekend at the Country Living Fair in NY, I was lucky enough to find a vintage gas station number. It's one of the old numbers they used for the gas prices. I still remember driving by seeing a guy up on a ladder changing the price! I also found a booth at the Country Living Fair that sold custom vintage license plate signs. The company is called Ginger Blue Decor. I thought this was a great idea! I had the VERY patient guys working at the booth help me make a custom sign with Hunter's name. When I gave it to Hunter he loved it! What kid doesn't like something cool with their name on it? Thank you for taking the time to read my blog. I was overwhelmed by the support and response I received about my last post where I shared about some of my flaws. It was wonderful to know I wasn't alone. I have the best readers out there in blogland! I know it seems my posts are getting few and farther between. Life has been really 'happening' right now. I can't seem to find the time to get everything done that needs to be done! I've painted a lot of pieces and I haven't shared them yet because I don't have the time to photograph, edit or write a post. I'm definitely not complaining. I know most people have very busy lives and I'm not alone in that. All this social media, linking up and networking has me a bit baffled too. I used to think I was pretty smart, for a true blond (hahaha), but now I'm feeling more and more dumb and behind the times. Technology is moving at such a fast pace that I'm contemplating finding a 10 year old to tutor me...and if you think I'm kidding, I'm not! I read a post recently by another blogger about her quitting her blog and why. Someone shared this on my Facebook group page after I was venting on my status update about how I can't keep up with it all and how she didn't like how she felt like a 'square peg in a round hole". This really got me thinking about blogging and appearances. Not appearances in relation to how people look, but more in relation to how people want their lives to appear, especially in social media and in blogs. I read and follow a lot of blogs. There are times when I read a post and think, "Seriously, how is their life so perfect, their home styled so nicely and they still have time to blog, cook, workout, take care of the kids and hubby?" I'm sure I'm not the only one out there who has thought this! I'm going to embark on some new territory for me. You might read my blog, look at the pictures and think something similar to what I just wrote in that last paragraph. I'm here to tell you my life isn't perfect, neither am I.
I think far too often people compare ourselves to others instead of thinking about what they themselves do well and commending themselves for it. I'm extremely guilty of this. I have for many years struggled with anxiety and perfectionism. I've never, ever thought to myself, "Wow Melody you're really good at this" I'm my own worst critic. I'm always ripping myself apart no matter what I do. I've tried so many things to combat this and I'm not as bad as I used to be, but that little tape recorder still runs in my brain 24/7. There are times when i don't want to get up and face the day because I'm too afraid. Too afraid I will say something wrong, upset someone or just plain make a mistake. I know I'm human, but I'm a perfectionist and if I can't be perfect it's painful. I remind myself of the fact I'm human all day, every day. 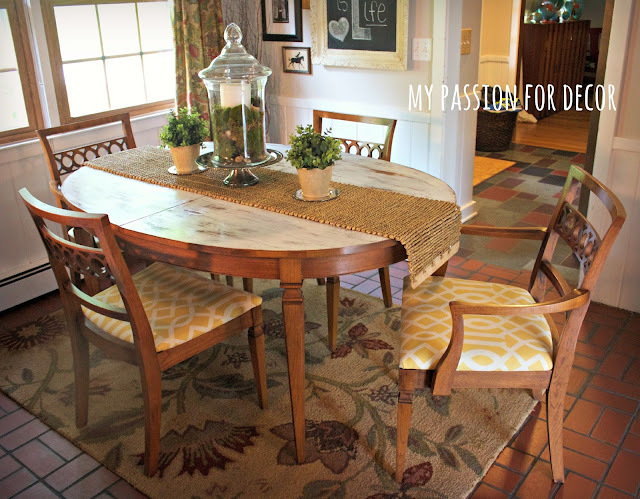 I wish I was perfect, but the truth is no one is.....my house is far from perfect and only looks like it does in my blog pictures when someone is coming over, the housekeeper is coming (yes I have a housekeeper and I'm admitting it) or I'm staging for a picture. I don't enjoy cooking or cleaning....I'm no domestic goddess! I can't sew to save my life and sometimes I'm a less than perfect wife and Mom. UGH....that's hard to write for the world to see! I know you're probably wondering, "Why on earth is she writing about all of this?" I've been wanting to write an honest, heartfelt blog post for awhile, but it scared the crap out of me (excuse my French). If you knew me in 'real life' you'd know that I'm very open and honest. I tell it like it is, even when I should keep my mouth shut, I'm sarcastic, loud and funny (at least that's what I've been told...my Son disagrees!). With all of this technology and 'pretend life' I wanted to try and make things more real. I wanted to shatter 'appearances'. I wanted to put it all out there and hope people can relate and connect with me beyond my pretty furniture pictures on the Internet. When I see bloggers who post every day, it honestly makes me feel so insignificant. It makes me worry that I'm falling behind. I know it's not a competition and that's not what I mean. It's more about trying to keep up and be able to have a successful blog and FEEL worthy of any compliments I might receive. It's a struggle to keep it all together and going smoothly. Last spring, summer and fall all I did was work on painting projects, blog and promote the blog. I didn't take time to swim with my Son in our pool. I avoided the gym as much as possible. I neglected my friendships and my relationship with my husband. I burnt this perfectionist right out! I couldn't pick up a paint brush or even think about paint for several months after doing this for awhile. I wasn't having fun and enjoying my life.....my life was passing me by and what did I have to show for it? A blog with pretty pictures? This year I resolved to have more balance. This is something that doesn't come easily for me. I'm kind of an all or nothing type of person. I'm usually really good at handling one thing well, but add in more and I'm a mess! I wanted this to change so I've consciously chosen to spend time with my husband, my son and my friends rather than stay in my stuffy garage and paint 7 dressers in a week. The point I guess I'm trying to make is we're all human. It doesn't matter who you are or how you 'appear' on the web or even in your real life, we all have strengths and weaknesses. We're all struggling with something, working on something in our personal life or just trying to get through each day in one piece. We all have out strong points too. You might be an amazing cook and enjoy spending the day in the kitchen, where as I would rather eat chalk than cook all day. Sometimes we spend a lot of time hiding our weaknesses from others. It's a lot easier to share our successes and strengths than sharing what we struggle with. However, when people realize you're struggling too they don't feel so alone. I started this blog for fun. I created My Passion For Decor because someone challenged me to. They said, "Melody you should start a blog where you share your projects!" I said, "WHAT? No one would want to read about my silly projects." The idea scared me and I was so afraid to put myself out there I almost let this experience pass me by. Instead, I put myself out there and took the chance. I can honestly say, now that I have some balance in my life, blogging is fun again. I don't love every aspect of it, but it's actually a blast!! The fact that I've been putting myself out there again and pushing myself to do something that scares me every day makes it fun. The scary things I have to do challenge me and help me grow. Sometimes the scary thing is just being myself and letting people through my barbed wire fence so they can see the 'real' me. Other times it's putting myself out there in a big way by doing a video chat on Hometalk+ and other times it's something simple like pushing myself to lift a heavier weight at the gym. I'm not going to lie, this post is scariest post I've ever written. My furniture isn't out there for the world to see this time, it's me....and all my flaws. I truly believe in my heart that things happen for a reason. I've had such a strong pull at my heart to write this post, I believe I'm doing the right thing. 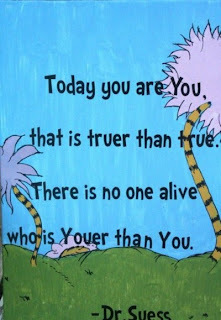 I hope this is what someone, somewhere needed to read today. If not, then it was cathartic and helpful just for me and I'm OK with that. 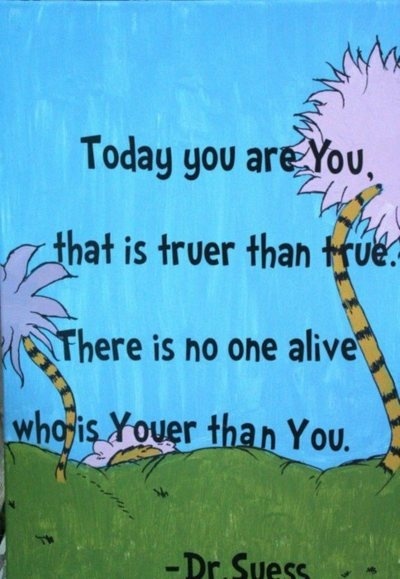 I also hope this inspires you to be yourself and not worry about how you 'appear' to others. I appreciate everyone of you who follow me here, on Pinterest, Facebook and Hometalk. I try my very best to email everyone back and respond to your comments, but sometimes things fall through the cracks. I apologize if that's happened to you! Please be patient, I'm a work in progress. As always, thank you for reading...especially this time! !